Gagaku is the oldest of Japan's performing arts, with a history of more than 1000 years and is the oldest living ensemble music in the world. In its modern sense, the term gagaku embraces the complete range of classical Japanese music and dance performed by the musicians of the Kunaicho Gakubu (Music Department of the Imperial Household Agency, Tokyo). Tokyo Gakuso is a relatively young group, founded in 1978 in response for the need for a group of expert gagaku musicians able to deal not only with traditional repertoire, but also with the challenges of contemporary pieces for the gagaku ensemble. Its forerunner, the Shigenkai, was formed in the late 1950s by musicians of the Music Department of the Imperial Household Agency, as a means to promote the public's appreciation of their ancient art through activities outside their official duties at the Imperial Palace. Tokyo Gakuso was named by Toshiro Kido, at that time producer at the National Theatre in Tokyo, and its founding music director was the sho specialist and Imperial Palace musician, Tadamaro Ōno. 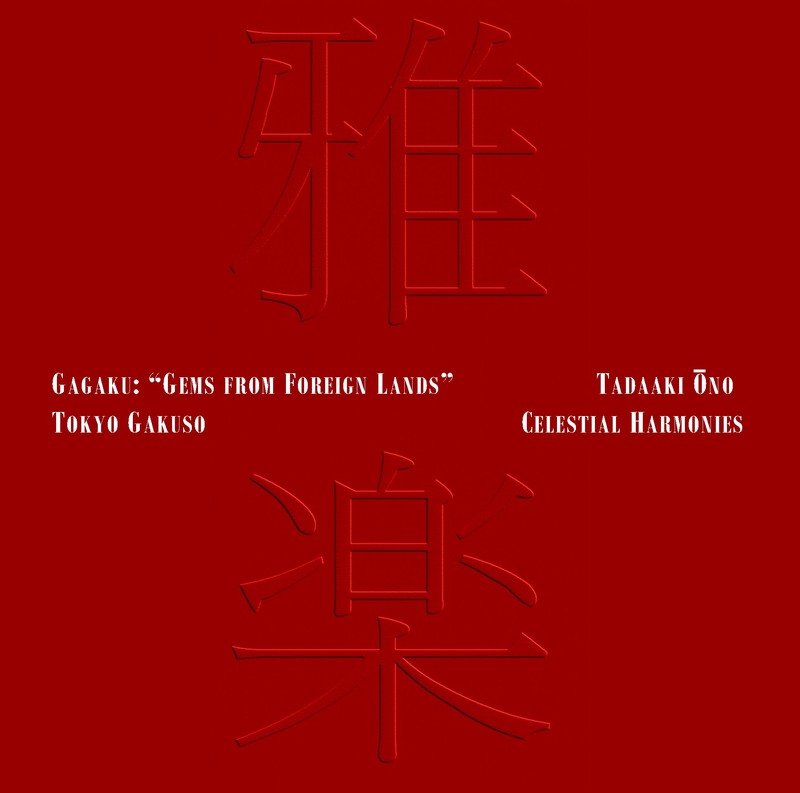 Since its formation, Tokyo Gakuso has been very active in the performance of new compositions, as well as long and rarely heard pieces from the classical repertoire. This is the second recording in Celestial Harmonies series documenting Japanese Gagaku music. Gagaku and Beyond (13179), released in 2000, has proven to be an essential addition to the Celestial Harmonies catalogue of important cultural documents. The music recorded on this CD, performed by a full gagaku orchestra of up to 16 musicians and over 20 instruments, represents all three major bodies of gagaku music and dance. Outa (Tracks 1 to 3) is a kuniburi-no-utamai performed only at very special ceremonies, such as those associated with rites of Imperial succession. Tracks 4 to 6 present a kangen (orchestral) performance of the togaku piece Konju, which can also be performed as a dance. In tracks 7 and 8 we are treated to an exceptional performance of the komagaku piece Kitoku in kangen style, with winds, strings, and percussion; it is generally performed as a dance, without the strings. The remaining tracks cover the two genres of accompanied court songs: the roei Harusugi and the saibara Anato, each preceded by the netori, or tuning piece, which establishes the mode in which it is performed. The full instrumentarium of the various gagaku ensembles is made up of wind, string, and percussion instruments. Traditionally, these have been referred to respectively as fukimono (blown things), hikimono (played things) and uchimono (struck things). This rare and important recording has been put together at the very highest level of expertise. Booklet annotation is provided by Associate Professor Steven G. Nelson, the only Western member on the staff at the new Research Centre for Japanese Traditional Music, Kyoto City University of Arts, Kyoto, Japan. 4 Ichikotsucho no Netori 1'08"
5 Konju no Jo 5'40"
6 Konju no Ha, Nokoriaku Sanben 15'06"
7 Kitoku no Ha 10'21"
9 Ichikotsucho no Netori 1'10"
11 Sojo no Netori 1'30"